A spice that is made from the Annatto seed which grows in a pod on Annatto shrubs. Protected by a pod containing 40 to 60 red seeds, the triangular-shaped Annatto seeds are surrounded by a red pulp that is separated from the seeds and pod when they are harvested. The pulp is processed to produce a commercial dying agent while the seeds are dried and made into a rust colored paste that is often used for coloring foods such as rice, smoked fish, butter, or cheese. Cheshire, Edam, Leicester, and Muenster cheeses are commonly colored with the rusty-toned paste to enhance the appearance of the cheese. 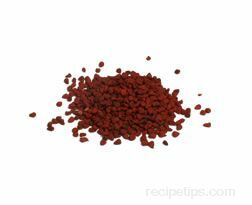 Also used as a spice for flavoring foods, Annatto seeds provide a sweet and somewhat peppery taste when added to various food dishes. To prepare the Annatto, place the seeds into the liquid ingredients being prepared or add the seeds to hot water to obtain the color and flavor desired before using the mixture to color rice or as a stock to add flavors to other foods. In addition to foods, this seed and pulp are used to color candies, cosmetics and textiles. Sometimes spelled as Anatta or Annato, the Annatto seed may also be referred to as an Achiote or Achote seed which is the common name for the spice in Mexico and Latin America, while in the Philippines the Annatto seed is known as Atsuwete or Acheute. To store, keep the seeds in an airtight container away from heat.